[Product Comparison] Our Kitchen Art Egg Master produces the best quality product around that no one can deny. - Heat Distribution: New Heating Pad Technology vs. 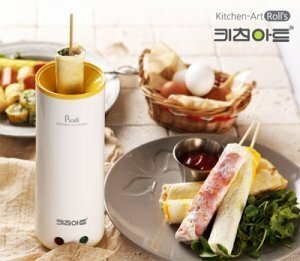 Coil Heating Method Kitchen Art Egg Master uses heating pads that evenly distribute heat throughout the cooking chamber for perfectly cooked food each time. Other companies use coils that are too widely spaced apart resulting in uneven heat distribution and unevenly cooked food. - Time: Quick Speed 5-6 Minutes vs. Cooking Time of 7-8 Minutes Our heat pads heat up evenly and quickly. Our cooking time is fast because we minimize heat loss as much as possible. Spiral heating coils do not distribute heat evenly and increase cooking time. - Coating: Triple Coating Technology vs. Easily Peel-able & Thin Coating Our product uses a non-adhesive, heat resistant, high temperature durable triple coating technology. Our coating does not peel and is scratch-resistant to ensure long usage. Other products have coatings that can be easily scratched and peeled off and mix into your food. - Detachable Parts: Detachable Bottom vs. Non-Detachable Bottom The bottom of our device contains a detachable stopper and cover made from compression technology that prevents oil from dripping out and allows for easy cleaning after cooking. Other products have a sealed non-detachable bottom that easily collects food residue. - Power Consumption: Energy Efficient vs. Non-energy efficient Egg Master heating pads use the lowest energy settings of 130W without sacrificing our cooking speed. Other products' heating coils use up to 180-250W of energy. State-of-the-art cooking technology for a fast, easy, and unique way to cook eggs. The bottom of the product is detachable and can be separately washed for hygienic purposes (patent pending product). Kitchen Art was founded in 1960, and we continue to herald our "Kitchen's Art Sense" slogan. Won Korean Consumer Satisfaction Award in 2013.